Reading by the dim light and low hiss of the gas lantern, my lids droop from being immersed in my book. Dad gets out of bed and draws our bunk curtains closed, then I hear the hiss and pop as he turns out the lamp. Good nights all round and I snuggle down into my bed, safe behind the metal rail that Dad made after we fell out once too often. I move the curtain aside to sneak a look out my tiny window, seeing dark tree trunks. The river gurgles past contentedly, only a few steps from my pillow, and soon I’m asleep. We migrate north most January school holidays from the sticky asphalt of Melbourne to this valley in northern Victoria, where it’s even more baking hot, but we have the river to cool us. 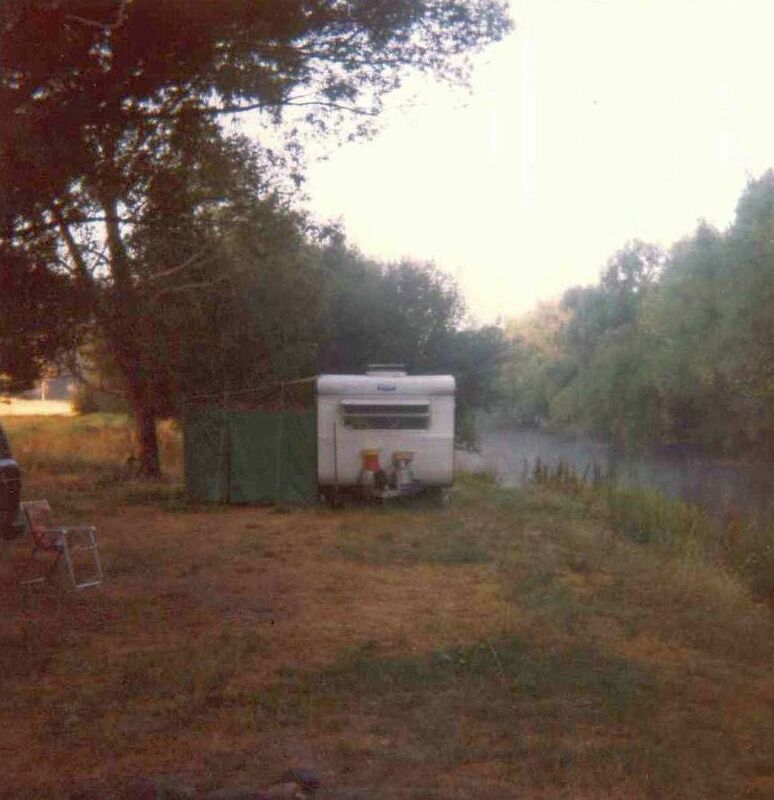 We line up our caravans and tents in Mum’s cousins’ paddock, alongside the Kiewa River, under the indigenous gumtrees with their rough brown trunks, and the introduced weeping willow trees that lean over the water and choke the river with their guzzling roots. But they’re so beautiful it’s hard to deny them, and we enjoy their shade and cool greenery. Water rats splash at night and there’s the added thrill of possibly seeing a platypus at play, if you’re up just before dawn. But they’re amongst the shyest of Australia’s strange creatures and you may not catch more than the slick movement of a wet-furred back. It’s enough to know they’re there. I love the birds – wrens calling to each other as they dart and flitter endlessly through the shrubs, the glorious caroling of magpies high in the stately eucalypts by the paddock gate, the tall ibis that stalk the long grass in mobs. We love watching the hill paddocks in the afternoons for Jeff and Pip’s girls to make their way to the dairy for milking time. They operate by internal clockwork, nose-to-tail, heads bobbing, looking for a feed and relief for their aching udders. Sometimes cows come down on the opposite side to drink, nosing and splashing greedily at the water. They are so curious about the kids gambolling like strange amphibians, but they snort and back away, bounding up the banks with tails aloft if we dare approach. The river is both friend and foe. One day low enough to comfort and refresh. Then they let water out of the hydroelectric dam further north, and the water level rises overnight, to become a stranger the next morning, deep and freezing. We avoid it for a couple of days until the dark and fast-flowing current slows and clears. Then my brother and cousins and I take to the river on blow-up lilos, lazily floating away to the bridge downstream. The best part is the bend where the water carves its way between low cliffs, and we stare up at the eucalypt saplings clinging to the rocky crags, silhouetted against a cerulean sky. We wear long-sleeved shirts and pants to protect from sunburn, and will be picked up by a parent in a car. It sounds so tame, but it’s an adventure to us kids, negotiating light rapids and faster currents that could pin you under fallen logs if you don’t paddle clear fast enough. 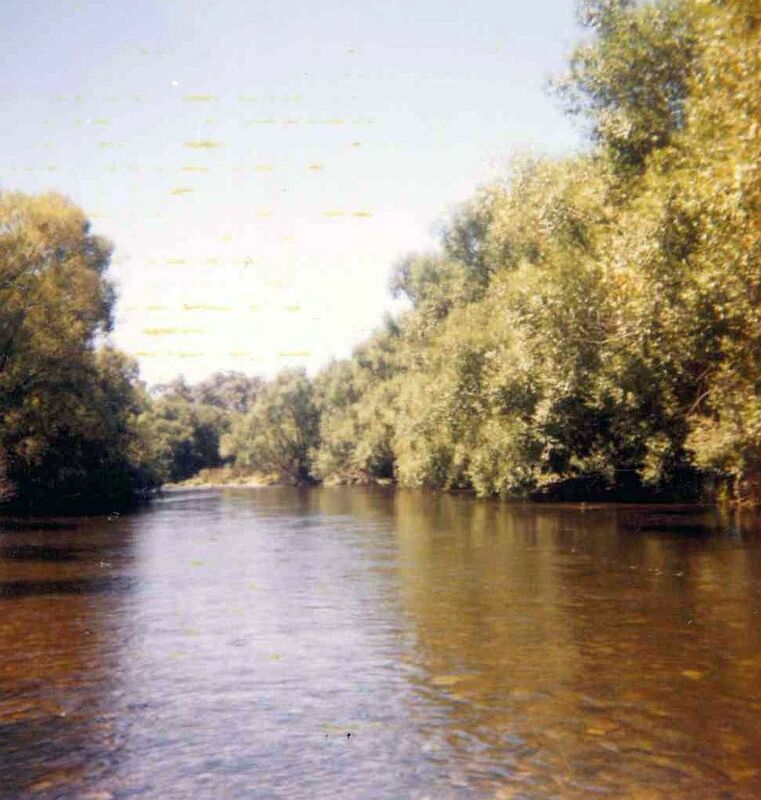 The waterhole upstream is my childhood bogie – to me it is the origin of Aboriginal bunyip legends. It’s deep, unusually so for this river, in a tight bend. So deep that the water barely moves, and is almost pitchblack, stained by millenia of gumleaves. Most frightening are the glimpses of pale shapes, enormous boulders that are ominous by their very size, like ghostly, misplaced elephants under the surface. My patient father spends quite some time encouraging me to jump into the water off the swing rope. I am the one who wants to take it on, but in the end I chicken out, ashamed and tearful. The bunyips win. Snakes are an ever-present fear, but rarely seen. So when one appears under Mum’s folding chair one hot lunchtime, weaving its way lazily through the dust, we all freeze in shock. Mum calmly enough lifts her feet and we are statues until it slides on its way. Not the country way to ignore it, usually you would take to it with the edge of a shovel, but as Mum says, it was just minding its own business, no harm done. We take evening walks up the dirt road, to the hill where Dad the engineer teaches us to zig-zag the steep incline, to use the camber and our energy as best possible. The air cools and freshens, and lightning sometimes flickers over the hills, accompanied by rolls of thunder. Getting home to the van before the fat rain drops fall is a challenge more than a necessity. Mum produces amazing thrown-together dinners of Christmas left-overs. There’s something about eating outside that makes cold ham, salad and coleslaw taste amazing. Plus her Christmas cake, the rich dark fruitiness lasting for most of the first week. All eaten to the sound of the Boxing Day test on the radio hanging above where we all gather on our folding chairs to eat, read, knit, chat and nap, before heading for a cooling dip. Family dogs come along for a swim, barking with delight at the freedom and companionship. The river stones fascinate me, smoothed and shaped from eons of tumbling and rolling under the water. I have one on a shelf still, with a rough initial ‘C’ in quartz. I took it as a symbol of something, I don’t know what – that I belonged there? But things have changed, the dairy farm is mostly sold off, and we rarely make the journey north now. There are occasional meetings to celebrate big milestones, where everyone gathers for a day with picnics and folding chairs.But mostly the river will live on in our memories as the family gathering spot, a bonding experience forever. 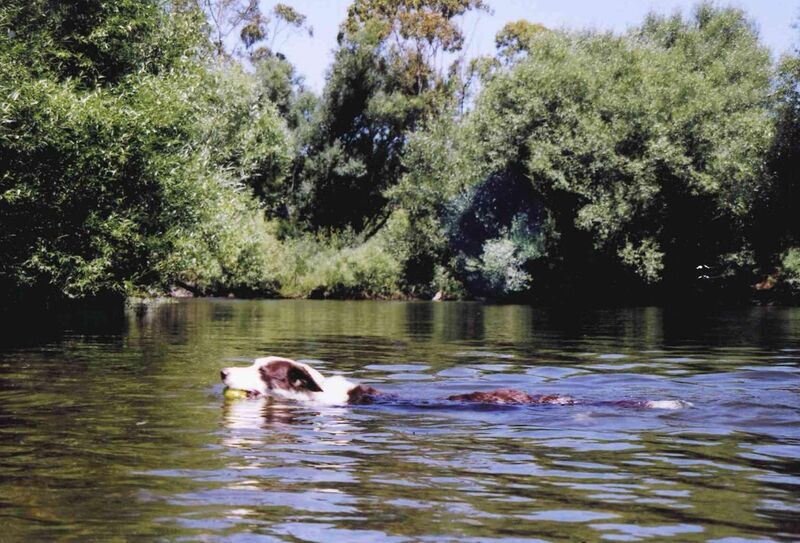 This entry was posted in Family and tagged Australian childhood, birds, Bunyips, camping, caravans, childhood, childhood holidays, dairy cows, dogs on holiday, family, Kiewa River, river, river floating, snakes, summer, summer holidays, swimming, water. Bookmark the permalink. Great story Carolyn! It brings back wonderful memories of those holidays. I must admit I’d forgotten the bunk-fence!